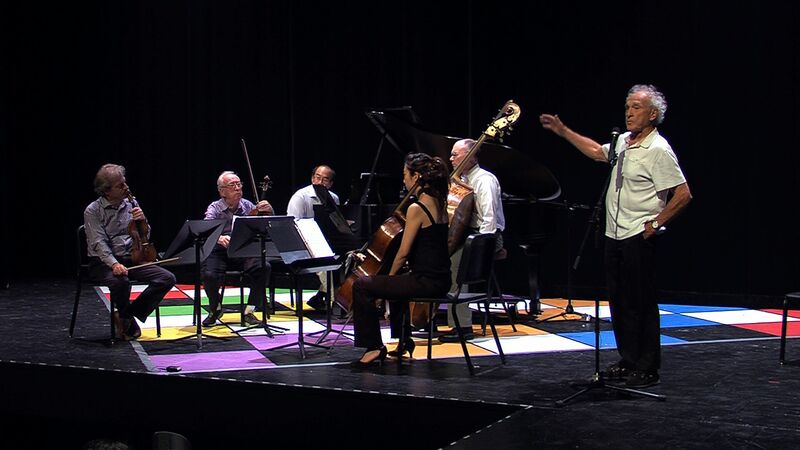 Arts and Cultural Alliance of Sarasota County » Symphonius performance by La Musica! Symphonius performance by La Musica! Sarasota County students and public were invited to this spring’s 30th La Musica International Chamber Music Festival to enjoy both new and well-known pieces and the world premiere of a new work by local composer, Jerry Bilik, Quintet for Piano and Strings, Opus 30. The title of the festival was “30 and Counting . . . A Look Ahead,” referring to the three decades that La Musica has been bringing world-class musicians to Sarasota’s residents and visitors. A quintet of La Musica’s 2016 musicians performed a free concert of Bilik’s piece for music students and teachers at Booker High School on April 11th. The illustrious ensemble included in program order starting with the violin, viola, cello, bass and ending with the piano: Federico Agostini, Bruno Giuranna, Jeong Hyoun “Christine” Lee, Scott Faulkner and Derek Han. Joining the performers on stage was the composer who described his writing process and answered the audience’s questions. The experience was a lively one as teachers had prepared the students with materials provided by La Musica’s Education Specialist, Karen Johns of ARTS4U2. The instructional materials addressed curricular objectives in English Language Arts, Music, Science, Social Studies, and Visual Arts. Study guides and DVDs are provided each year free of charge to all Sarasota County public schools and also posted on www.EdExploreSRQ.com. In addition, all Sarasota County students are offered free tickets to La Musica rehearsals and concerts.